60+ Democrats Advocated for Border Security Compromise. Will They Deliver? 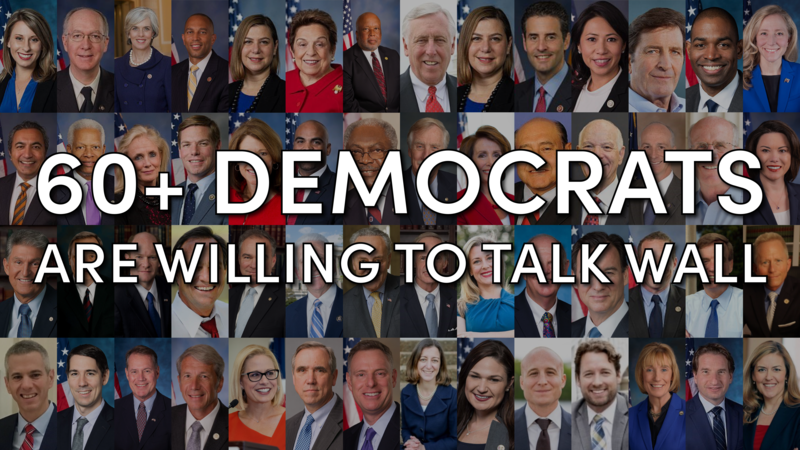 Over the past weeks dozens of Democrats —including their own House Majority Leader— claimed that a physical barrier should be part of the solution to address the border crisis and should be negotiated on once the government reopened. With President Trump reopening the government in good faith, will the 60+ Democrats quoted below follow through on their promises and demand physical barriers be included as part of a border security solution? Or will they allow Speaker Pelosi to give in to the open borders faction of her party? Physical barriers are bipartisan, common sense, and supported by experts as a means to secure our border. They must be part of our approach to address the crisis of crime, drugs, and human trafficking at our southern border. Democrats need to put their money where their mouth is and negotiate in good faith now that the government is open. A negotiated compromise on border security must include funding for physical barriers along our southern border. The safety of our communities depends on it.